View the Labels/SDS information for Princep Liquid Herbicide. Princep® Liquid herbicide provides turf professionals with a tool to use in the fall to control a number of pesky winter annual weeds including Poa annua. It can be used on bermuda, centipede, St. Augustine and zoysia. It enters the weed through the roots to inhibit growth. Pre-emergence control of annual bluegrass, burclover, lawn burweed, common and mouseear chickweed, henbit and others. A second application can be made to control summer annuals as long as it is made before June 1. It can be tank-mixed with Pennant Magnum® herbicide to control additional weeds Controls a wide variety of broadleaf and grassy weeds in warm season turf. Safe to use for winter weed control on semi-dormant turf with no green-up delay. 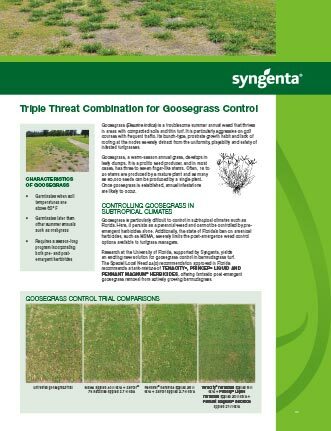 Control goosegrass with Tenacity, Princep and Pennant Magnum herbicides. Princep®, Greencast® is a trademark of a Syngenta Group Company. 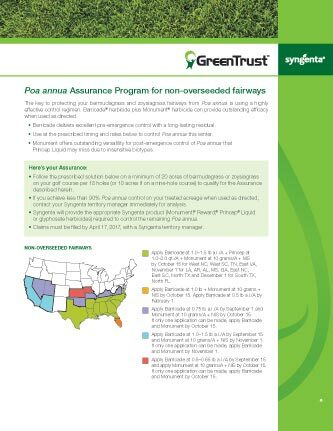 Pennant Magnum® is a trademark of a Syngenta Group Company.